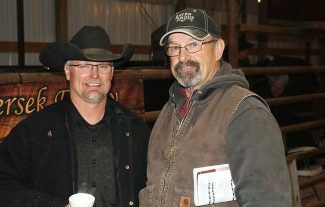 Sale consultant Chris Earl with Rod Petersek after a very successful Raven Angus sale. Gary Ludeman, Springview, Nebraka, purchased a Sitz Superior 10971 herd bull prospect at the Raven Angus sale. Even with a fast moving winter storm brewing, Raven Angus hosted an excellent crowd of buyers and spectators for their annual Bull Sale. Raven Angus hosted another big crowd for their annual bull sale, but it was somewhat smaller due to a major snowstorm in their area at sale time. Rod, and sons RJ and Reid, ranch in south central South Dakota. 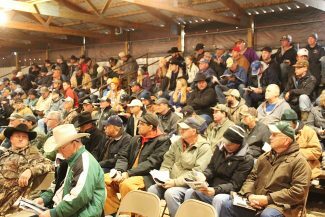 Even though they added more bulls, the demand was strong, and this was a very successful sale for the spring of 2017. The Petersek brothers do everything they can to ensure the success of their customers. 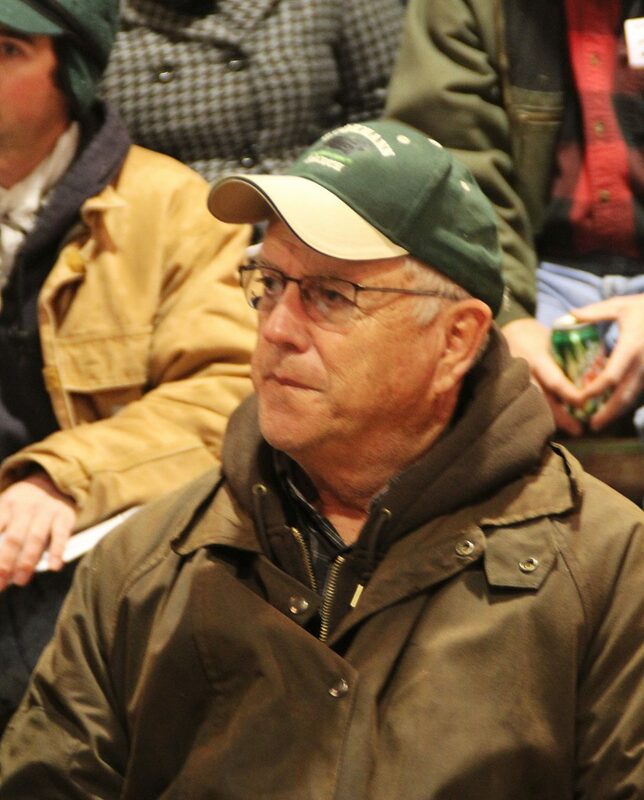 They stay in contact with these cattlemen, and help them market their calves. With their backgrounding program, Peterseks follow their cattle all the way to the packer. Because of this, they know what genetics they have to provide to their customers—carcass and production traits that it takes to survive in this industry. This was a very strong set of bulls, with several embryo transplant calves from their leading donor cows. I felt that the quality ran very deep into the sale, with very few bottom end bulls being offered. Many firms set in, and bought bulls in volume. Many repeat buyers were on the seats. Top selling bull of the day was Lot 26, selling for $21,000 to Maher Angus from Morristown, South Dakota. This yearling bull was a son of the Petersek home-raised Sitz Angus herdsire, Raven Powerball 53. He was out of a daughter of BC Matrix 4132 who ratioed 116 on three calves. Born at 79 pounds, he weaned at 815 pounds, and grew to a yearling weight of 1340 pounds. His EPDs were CED 6, BW 0.3, WW 58, MILK 36, MARB 0.81, RE 0.64, and $W 76.34. His IMF was 4.86%. Lot 215 was a two-year-old, selling for $20,000 to Hoffman Ranch of Thedford, Nebraska. This son of Sitz Superior 10971 was out of a daughter of Lemar Windy 4345 who was a Pathfinder with a ratio of 110 on three calves. He posted EPDs of BW 3.1, WW 56, YW 107, MILK 24, MARB 0.31, and RE 0.18. Lot 216, another two-year-old, sold to repeat buyer, Gary Ludemann, from Springview, Nebraska, for $14,500. He was a flush brother to Lot 215, and had EPDs of BW 2.9, WW 54, YW 98, and MILK 22. 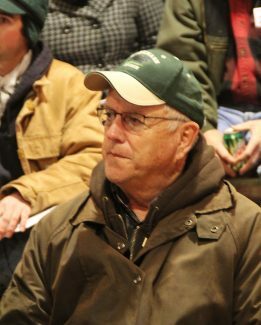 Guy Mills from Ainsley, Nebraska, chose the two-year-old bull, Lot 256, at $11,000. Here was a son of Baldridge Brick House who was out of a daughter of Lemar Packer 5Y. This long-sided bull was born at 72 pounds and weaned at 868 pounds. His EPDs were CED 7, BW -0.5, WW 72, YW 120, MILK 34, CW 50, RE 1.02, and $W 79.04. A continued sale highlight was the pick of one registered replacement heifer from the sisters and half-sisters to the bulls that sold. Simon Cattle Company from Farley, Iowa, paid $17,750 to make their selection. A good day for the Petersek family, despite the weather!